1. Take half a pound of the finest smooth flour. 2. Sift it through a hair sieve onto the board, heap it up and make a hole in the centre. 3. In this hole put the salt, the yolk of an egg, the fat, the lukewarm water and the cream and mix well with the fingers of the right hand. 4. Then knead the mixture till it comes clean off the hand and the bakingboard. 5. 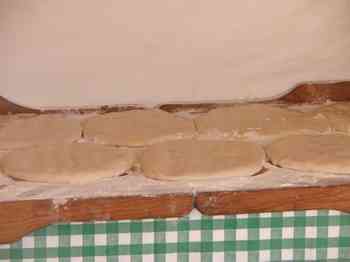 Make a flat round loaf of it, dredge floor over it, cover with a warmed linen cloth and let it stand for 10 or 15 minutes. 6. Spread a tablecloth on the kitchen table, dredge it with flour, pick up the dough on the knuckles of both hands and put it on the table-cloth with a spreading movement of the hands. 7. Then put the fingers of both hands under the dough and pull it gently in all directionstill it covers the whole table and hangs down over the edges. 8. Great care is needed to prevent tearing the dough. It should be as tissue paper. 9. When the dough has been pulled out thin enough, tear of the thick edges with a winding movement round the table. 10. Sprinkle some lukewarm lard on the dough, leave it for a few minutes, then spread or sprinkle over it whatewer filling is desired. 11. Fold the edges back and with the aid of the table-cloth, caught up near two of its corners and held stiffly, roll it up into a roly-poly, then put it into a greased baking-tin, brush with melted fat or the yolk of an egg and bake for 20-25 minutes in a moderate oven.